When I first saw this advert, the thing that occurred to me most strongly was that the ad featured Alan Hale, the Skipper on Gilligan’s Island. That was until I realized that the ad was printed when Alan was only 12. It’s funny how little people have changed over the decades. 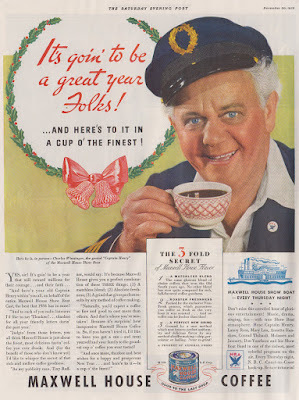 It’s not Alan, it’s Captain Henry, Charles Winninger from the Maxwell House Show Boat! Check it out on the NBC Thursday Night Coast-to-Coast Hookup! Just tune your radio dial to 1933.